Pours a nice amber reddish copper color with an off white head. The head is pretty thick but somewhat soapy. The head also diminished fairly quickly, just a nice ring around the sides of the glass and a patchy island in the center. The nose is a nice American Amber, fairly rich in malt aromas with some spicy notes and just the hint of hops, well after a gentle swirl there is more of a hop presents. Nice carbonation fresh and clean tasking beer with just a hint of pumpkin spice. As a matter of fact if you where not thinking that this was a pumpkin ale you may miss it. I actually like this style of pumpkin ale; it’s a good amber ale first with some pumpkin spice second, Not bad for Coors. The taste starts with a nice malt sweetness then the tingling of the carbonation over the tongue followed up with a nice hop drying finish then you are finally left with some cinnamon/pumpkin spice. Not too much just hint of spice. The beer is now 66 degrees and it is still impressively smooth. Even at this temperature there are no unpleasant flavors coming out of this beer. Good to the last drop. Coors could easily market this beer as an American Amber. It’s a smooth easy drinking amber ale, nothing very noticeable about it (including pumpkin) but more importantly there was nothing unpleasant about it either. 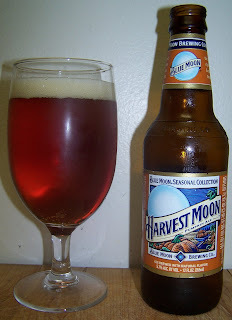 For an American Amber Ale this was a very good beer but for a pumpkin Ale it is really lacking pumpkin flavors. Now I stated earlier that I like a more subtle pumpkin spice in my Pumpkin Ale but this one was a little too subtle, some may even say non existent. If you want to try a Pumpkin Ale but didn’t want to get one of those liquefied pumpkin pies than this would be a good pumpkin ale to start with. Like I said there is nothing unpleasant about this beer it’s just lacking that little extra that you would expect in a Pumpkin Ale. A very good easy drinking American Amber.